Water is an essential resource for mankind and our ecosystems. 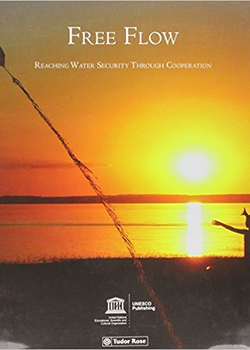 Free Flow is a fully illustrated book with over 100 authors work on water management and cooperation at international, regional, national, municipal and local levels. Their commentaries draw upon experiences around the world, reflecting how people are changing their interaction with water to improve sustainable development. The publication reflects progresses and challenges in these fields, highlighting good practices in a wide variety of societies and disciplines. The book strives to project experiences into future actions and encourages further institutional commitments to better understanding of and more effective management of water cooperation in order to achieve sustainable development. Ismail, S., McCann, I., Shahid, S., Chandler, F., Amrani, M.